Bali Rafting + Mother Temple + Volcano tour is one of our interesting packages which bring together whitewater rafting on the Telaga Waja River with other favorite tours: the Besakih Mother Temple, which is Bali’s largest and most holy temple, after that it was headed to Kintamani and witnessed the wonderful views of the volcano Batur with its crater lake. Then stop in the spices garden and continue your trip to Tegalalang village, where you will enjoy the beauty of the rice terrace. 10.00 – Start The Rafting Adventure at Telaga Waja River . 12.30 – Arrive at Finish point / Shower + Buffet Lunch. 14.00 – Visit Besakih Mother Temple. 15.30 – Visit Kintamani with Batur Volcano & Lake Batur Marvelous view. 16.30 – Visit Temen Spices garden. 17.00 – Visit Tegalalang Rice Terraces. 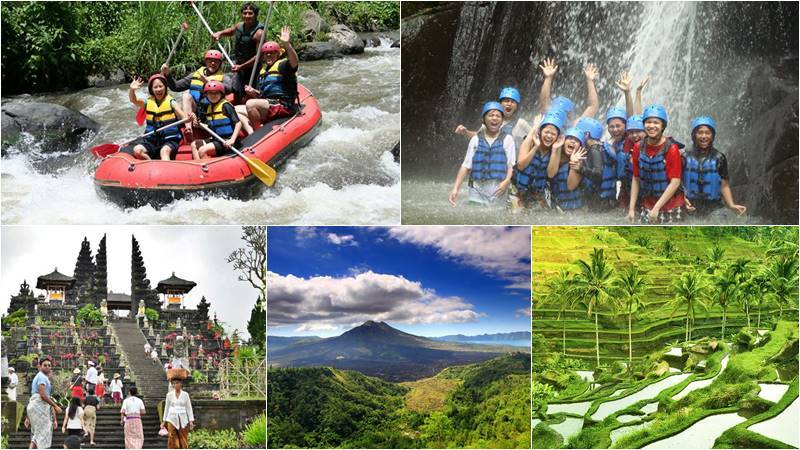 Experience real fun-action white water rafting at Telaga Waja River Karangasem, situated on the slope of Holly Highest Agung Volcano and discover the beauty of Bali island through the pure nature, exuberant jungle and lovely terraced rice fields. Paddle through the amazing waterfall and plunge 3 meters from Bajing dam water slide into the churning crystal white water, this rafting is really pumping your adrenaline. Buffet lunch will be served after shower and changes. The first temple built in Bali or famous for Mother temple built by Rsi Markandeya, Javanese high priest, who went to Bali in the 8th century. The temple is located in the slope of Mount Augung at around 1000 meters above sea level. Besakih Temple includes a large temple complex including the family temple, which later was added in the 16th century by another Javanese high priest, Danghyang Nirartha. “Penataran Agung” is the main temple courtyard in Besakih with triple throne known as “Padmasana Tiga” with separate seats of the trinity God Brahma, Wisnu and Siwa. At cooler temperatures, visitors can walk along the path while enjoying the towering pagoda. Kintamani is a village on the hill and it is surrounded by a beautiful panorama. We can see a wonderful panorama of Kintamani overviewing the semi-active Batur volcano and the large Batur Lake in a valley. It is located with cool weather in the plateau area. We will be able to look at a rural area near the lake when we stand at Kintamani. This place is well known, and many tourists have visited it. Take your time and taste your local coffee, ginger, tea and other local produce in a peacefully garden with local spices such as coffee, vanilla and cloves, and see how they produce coffee traditionally. The renowned Bali coffee gold is Luwak coffee from civets manure (cat poop coffee), which is considered as one of the most expensive coffee worldwide. Picturesque northern Ubud rice terraces, popular among visitors. A restaurant or coffee bar are now available along the site, and rice terraces are great to enjoy while having tea or coffee. Some locals try their luck with their native English to sell the souvenir to the visitors. Ticket for the Telaga Waja River rafting.